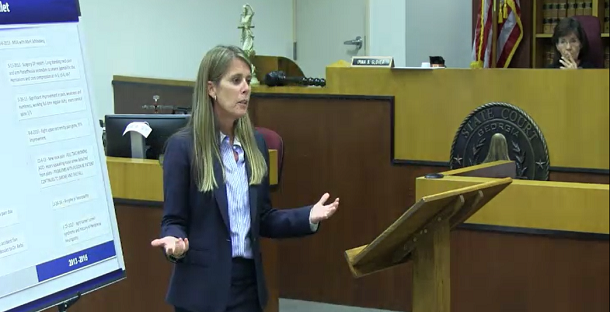 Alexandra Bowen Higgins delivers her opening statement on behalf of Mark Schlosberg, who is accused of responsibility for an accident that injured Joseph Reboulet's neck and led to his spinal fusion. Marietta, GA—Attorneys Monday sparred over the cause of a 2013 crash and the persistent pain that led to a Georgia architect’s cervical spinal fusion, as trial opened in his suit against the driver that rear-ended him. Reboulet v. Schlosberg, 14-A-3421-3. Mark Schlosberg struck Joseph Reboulet's vehicle from behind as Reboulet stopped in a line of traffic behind a car waiting to turn from a travel lane rather than an available turn lane. Reboulet, an Atlanta-area architect, claims he suffered neck injuries so severe he had to undergo a spinal fusion that did not completely resolve his nerve pain. Reboulet claims Schlosberg caused the accident and is responsible for his damages, including more than $200,000 in medical bills to date, according to court records. Rogers noted that Schlosberg was the only driver who struck another vehicle in the five-vehicle line of stopped traffic when the crash occurred, and he criticized the defense for what he termed a “kitchen sink” strategy. “[The strategy] is to present to you every single possible defense, including the kitchen sink, in hopes something sticks,” Rogers said. The case is expected to go to the jury on Wednesday. Joseph Reboulet is represented by Fried Rogers Goldberg's Michael Goldberg and Eric Rogers. Mark Schlosberg is represented by Alexandra Bowen Higgins. Learn how you can watch Georgia trials from around the country.